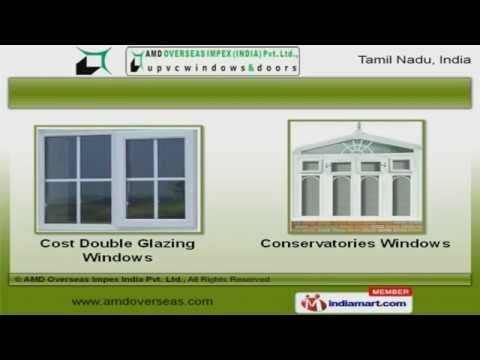 Welcome to AMD Overseas Impex India Private Limited, Manufacturer and Exporter of Windows and Doors. The company was incorporated in 2012 at Tiruppur. We have spread our wings to East Europe, East Asia and other countries. Peerless quality products and Latest market trends help us to grab Clientele like Janani Builders, Prince Hotel and others. We offer a wide array of UPVC, PVC and Glass Windows. Casement, Anderson and Bay Windows offered by us are a class apart. Our Cost Double Glazing and Conservatories Windows are best in the industry. We also provide Windows Frames and UPVC Doors that are well known for their durability. Window Ventilators and UPVC Doors for Hotels are extremely reliable. Sliding Window Frames for Apartments and Small Bay Windows for Hospitals are cost effective.